Much like babysitting a friend’s only child, camping is an idea often better resigned to the realm of well meaning theory rather than practice. As far as activities go, few recreational pursuits are as divisive as voluntarily eating, sleeping and maintaining acceptable levels of personal hygiene while al fresco. One man’s Walden invariably becomes another’s Lord of the Flies – quite literally, more often than not. 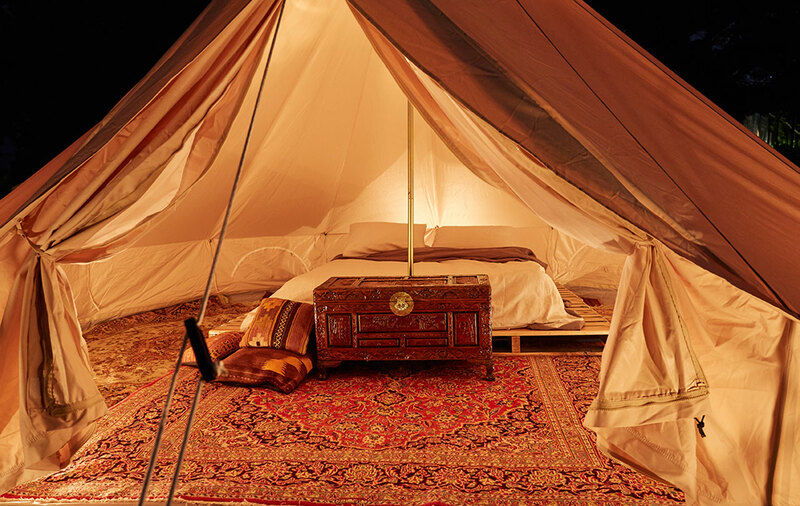 Those with an aversion to pursuits reliant on spending extended periods of time in the great outdoors would do well to reorient their expectations of the experience through a cursory introduction to ‘glamping’. As with most unenviable pastimes, affixing a ‘glam’ prefix to the task at hand does wonders when it comes to alleviating any foreseeable woes. Although ‘glamping’ has become as well-established a cultural portmanteau as ‘brunch’, there are undoubtedly many for whom the concept is as foreign as it is undesirable. For Marcus Kersch, co-founder of the Simple Pleasures Camping Co., ‘glamping’ isn’t a fold out army surplus cot and complimentary Wonder White™ with breakfast, as I was once lead to believe by an over eager tourism officer. Kersch would know too. 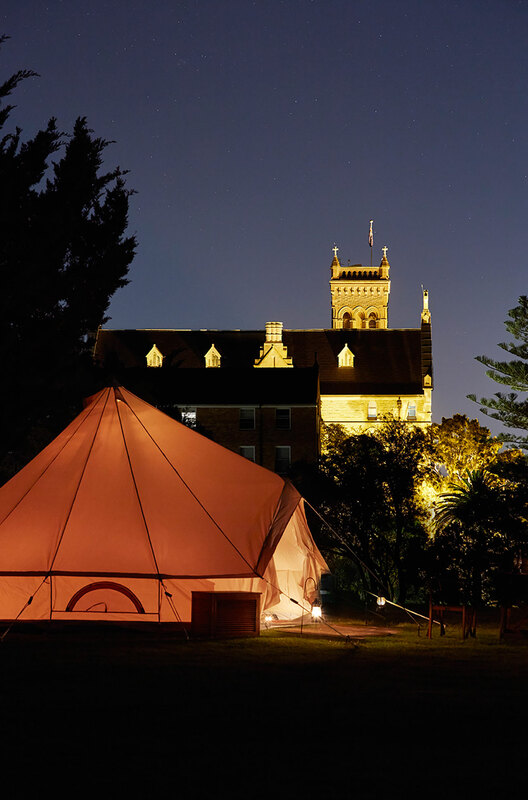 One year after founding Simple Pleasures with his business partner Dugald King, the two have pitched a 10-tent Bedouin on the Beaches pop-up within the grounds of Manly’s International College of Management that exemplifies the glamping ideal more than any other likeminded venture that I’ve seen. As far as venues go, you’d be hard pressed to find one in Sydney as spectacular as the grounds of St. Patrick’s estate, an erstwhile seminary that you’ll no doubt recognise as Jay Gatsby’s mansion in Baz Luhrmann’s maximal adaptation of the F. Scott Fitzgerald classic. Considering the more recent cultural implications of the estate and its personal resonance with the two co-founders, it’s only apt then that Kersch and King would set up a luxury campsite here for the duration of the summer. “We had originally met in Manly about 12 years ago,” Kersch told GRAZIA. “We were camping together for a couple of weeks one summer – Dugald [a longtime Manly resident] had just sold a bar and we had one of those rare periods where nothing was holding us back. We started talking more as we spent days in the bush, surfing and camping, about there being a market in offering people what we were experiencing. Kersch continues that he and King wanted to create a lifestyle for themselves that allowed them to move away from Sydney, and which allowed them to provide likeminded people with a positive, wholesome experience. Something outside of the ordinary experience of camping with which most are likely familiar: ill-fated childhood camping trips that, more often than not, end in a deluge of either rain or tears – or both. 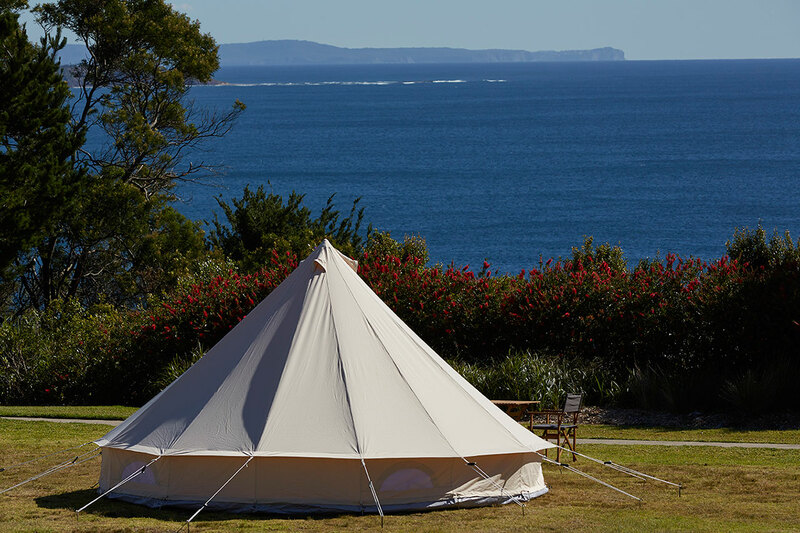 Today, Simple Pleasures offers luxury, eco-friendly ‘glamping’ experiences on the Mid-North Coast of New South Wales at pristine destinations including Seal Rocks, Bluey’s Beach, Wallis Lake and Booti Booti National Park. Tapping into a burgeoning demographic of festivalgoers for whom the idea of a repurposed yoga mat no longer an adequate bed makes, they’re also pitching at Lost Paradise, the 2017 Surfing World Camp and at a site close to next year’s Splendour in the Grass festival. As their business grows, Kersch concedes that such treatment as grown to become even more valuable. Bedouin on the Beaches will run until January 31, 2017. You can find out more information here.